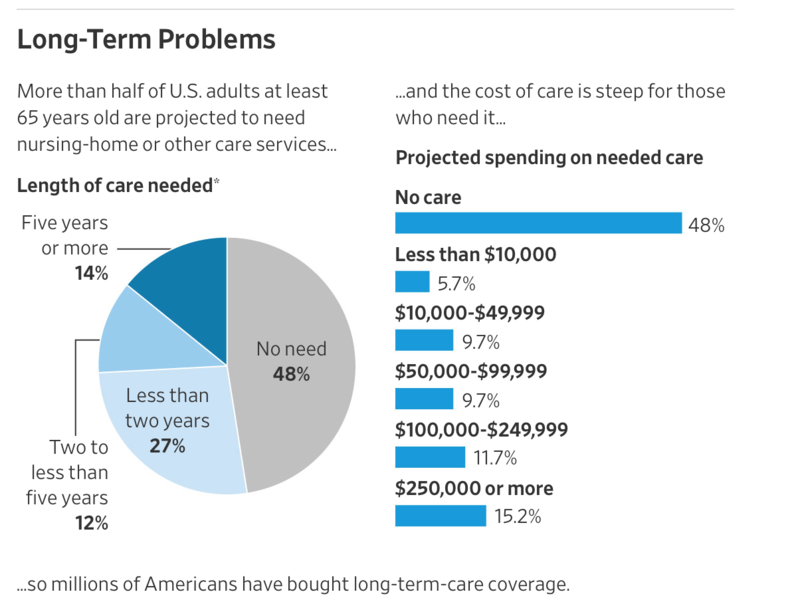 A Wall Street Journal article gives an overview of a topic we discussed briefly before: an escalating crisis in the long-term care business. As we explain in more detail below, the entire industry massively underpriced policies that cover nursing home and other types of long-term care for the elderly. They are now playing catch-up with hefty rate increases. This puts those who paid for coverage in a terrible fix: do they abandon the policies entirely, when they have paid in substantial amounts of money and the policies do have real economic value should they need them? Do they reduce the amount of coverage so they can keep the premiums affordable? Or do they take the hit, when it might mean serious cutbacks to spending or retirement savings. In the past two years, CNA Financial Corp. has increased the annual long-term-care insurance bill for Ms. Wylie and her husband by more than 90% to $4,831. They bought the policies in 2008, which promise future benefits of as much as $268,275 per person. The Wylies are bracing for more increases. And there is an additional set of issues even for those who can afford to pay for pricier coverage. As we described in our earlier post, even the long-term care insurer that is supposedly the best in terms of paying claims, Genworth, now has many complaints on consumer websites. My own experience, when my mother was injured long enough that she might be submitting a claim, was that I got a HAMP-level run-around: they would not deal with me over the Internet and I was repeatedly disconnected when put on hold. When I finally reached a rep, I was told that they would need to send a nurse to evaluate my mother…but the phone rep could not schedule that visit and claimed they could not reach the unit responsible, and would have someone call back instead. We never got that call. In other words, the typical behavior of insurers under duress is to engage in insurance fraud, which is to refuse to pay for valid claims. One way to do that is to put customers to go through so many hoops that some give up. One consumer complaint I read more than once regarding Genworth was that they would repeatedly claim that they had not received powers of attorney from children trying to get claims processed on behalf of aged parent. In evaluating whether it was worth it to renew my mother’s Genworth policy, I have assumed she will have to spend $10,000 in nastygrams to get claims processed. Many adults don’t realize until they approach retirement age that Medicare does not provide for coverage in what are called long-term care facilities, such as assisted living (where the residents aren’t hospitalized but need help with some activities, like bathing or getting dressed) and nursing homes. Medicaid does, but it has strict financial eligibility limits (among other things, you will effectively be required to exhaust your financial assets). And based on reports by readers, facilities that accept Medicaid patients often do not provide a high standard of care. Insurers rushed to fill this gap in a serious way about 40 years ago. Long-term care policies will reimburse the cost of care in approved facilities, or in many cases with approved home health care services, up to a daily maximum amount. Policies typically also have a maximum total payout amount (which may be expressed in other terms but amounts to the same thing). The problem was twofold. One was that the insurers had no experience in offering this sort of policy and made unduly optimistic assumptions, such as how many people would lapse (stop paying before they used the policy), how long they would live, and how many days of care they would consume if and when they needed care. Ironically, when my father was looking at whether to get a long term care policy over 30 years ago, he was frustrated at his inability to get data to make any sort of an informed decision. It turns out the insurers themselves didn’t have enough of a track record to be doing any better than guessing, and they guessed wrong. To give an idea of how seriously off some of their basic assumptions were, they assumed a lapse rate of 5% a year. Remember, when someone lapses, that’s a boon to the insurer and everyone else in the pool, because the funds they paid into the policy they abandoned goes to everyone else. It turns out that everyone who purchased these policies understood how valuable they could be and paid like clockwork. The Wall Street Journal reports that the lapse rate was 1%. It turned out that nearly everyone underestimated how long policyholders would live and claims would last. For example, actuaries, insurers and regulators didn’t anticipate a proliferation of assisted-living facilities. And they assumed families would do whatever they could to avoid moving loved ones into nursing homes, holding down policy claims. By the late 1990s, assisted-living facilities were widely popular. Especially at well-run ones, staff members looked after policyholders so well that they lived years longer than actuaries had projected. Residents “are taking their medications; they are not falling,” says Mr. Bodnar, now a senior executive at Genworth. A possibly even more fundamental modeling issue is that insurers arguably have and continue to be using the wrong type of model1. The second big problem is years of super low interest rates. This has meant that investment returns for year have fallen vastly short, on an inflation-adjusted basis, of what they had forecast. The results have been devastating for all long-term investors: life insurers, pension funds, and ordinary people trying to save for retirement. On top of that, some insurers like Genworth offered policies that promised no rate increases over the life of the policy. Consumers who purchased them and made plans assuming the payments were fixed, have been hit in the last few years with massive increases. Fewer than 100,000 long-term-care insurance policies were sold in the U.S. in 2016, and sales fell to about 34,000 in the first half of 2017, the industry-funded research firm Limra says. Both those totals are the lowest in more than 25 years. The business peaked in 2002 with about 750,000 sales. The latest policies typically cover less and cost more. According to the insurance agents’ trade group, a 60-year-old couple can expect to spend about $3,490 in combined annual premium for a typical policy that starts out with a maximum payout of $164,050 per person and then grows 3% a year to $333,000 when the couple is 85. People approaching 60, which is usually the latest these insurers will write policies, don’t have good options unless they have a net worth of over $2 million, since then it makes more sense to roll the dice and self insure. By contrast, some financial advisers argue that if you have less than $300,000 in assets, you are better off spending them down and going into a Medicaid home if need be. But there are plenty of people with more than $300,000 in assets (say some accumulated home equity plus some savings) who would find it hard to pay the premiums, even if they kept working past normal retirement age. Given the plunge in people buying these policies, the US is clearly moving towards the neoliberal answer of “Die faster!” Better approaches for providing in-home care could reduce the overall burden, but there seems to be no policy will to move in that direction. In about 2003 I had professional reasons to research and publish a detailed study on LTC insurance. There are several important and structural reasons for the current situation that extend beyond Genworth. First, as with almost all insurance products, the policy is complex, hard to understand and for almost all who purchase them it is unclear what the coverage really is until a claim filed. Second, LTC became a hot area for growth in the industry and was being heavily pushed by the consulting actuaries. It was one of the few areas of growth once variable annuities collapsed with the market in 2001. Third, this is a lapse supported product and the industry got the lapse assumptions horribly wrong. In other words, they assumed people would pay premiums for a few years then stop. People realized they need this coverage and kept paying the premiums. Finally, there is an important regulatory component. Life insurers report their financial results in blue books and property-casualty (P&C) insurers in yellow books. LTC, while in blue books, is much more like workers comp insurance which is in yellow books. Yet, the life insurers treated it as though they could use existing life insurance data and thinking, as opposed the loss development triangles common to P&C insurance. In our analysis we constructed pro forma loss reserve triangles for LTC and they clearly showed that there were massive reserve deficiencies. The result of this was that they needed to both increase rates and significantly increase reserves — billions of dollars worth. Finally, at the time the reaction of the industry to this work, it was presented in a plenary at the annual meeting of the Society of Actuaries, was to attack the work during the session. Not rebut or say it was wrong. This entry was posted in Banana republic, Doomsday scenarios, Free markets and their discontents, Regulations and regulators, Social policy on January 18, 2018 by Yves Smith. This is a very important and deeply troubling issue. A professional colleague told me recently that someone in the industry explained to him that his job is to make sure no one is able to claim benefits under their long-term care policy. Stories such as this have been circulating for years–offering a multitude of concrete examples. It’s the classic insurance bait-and-switch. I tell clients to stay away. This is where medicare part G comes in. When the time comes you take your Gun and and shoot one of these insurance industry scum or a corrupt politician – your choice. Then you get 3 meals a day, all prescription drugs paid for and administered, a safe place to sleep and socialize, group exercise. Two stages of long term care. First, you have family members support you. Then if you are lucky, you die quietly at home. Second, if you fail to die at home, and you are lucky, you get full time care at a rest home/nursing home. In the earlier period, the medical community makes a profit off your decline. It is harder for the medical community to make a profit off the later period. One can hope that one goes into full time care with an estate, because insurance won’t want to pay for it, except Medicaid. And Medicaid requires that you give up every resource, every income, into the System. No inheritance for your family. Of course taxpayers in general and wealthy people in particular, don’t want to pay the taxes for Medicaid (not the same as Medicare deduction). The worst outcome is you have no supporting family members, and your bad health and limited sanity make living at home into a screaming Hell, without alternative. Yes, it is best to die at home in your sleep. For real. We don’t all get that. Homes can be saved from medicaid seizure if proper planning is done beforehand. You can deal with the medicaid limits by putting the assets into an irrevocable trust. Complicated enough, with the additional hitch that Medicaid requires this transfer to be done several years (not sure how many) before applying for Medicaid. I think it was 5 but now is seven. somebody should chime in. There are variations based on state law. My grandmother moved to a nursing home recently, and it’s supposed to be covered by Medicaid; however, since she never qualified for MassHealth before, the state has been very slow in processing her paperwork and qualifying her. It has been nine months and nothing has been paid beyond the small amount that comes from her Social Security check. The rumors are that this because the state simply doesn’t want to pay and is delaying as long as possible hoping that some people will give up. My father hired a lawyer to do all of this, but people who didn’t may very well have given up. Check to see if she has been treated with any of the three medications that sustain life even though real living is over. If so, she is paying for something she really never hoped for: Nursing Home care for an extended period. Instead of hiring a lawyer to make someone pay, hire a lawyer to protect her from being treated for every situation that would peacefully let her pass away. If she is up and walking, enjoying meals and social interaction, of course this is not what I describe. But if she is frail, weak, wheelchair-bound, in diapers, needing someone to feed her, then ask YOURSELF: Is this what I want when my time comes. Most people would say “No!”. But your grandmother was never asked because no one stops to think about it: YOU have control. You can say enough! Where I live the $268,275 would cover a person in a skilled nursing facility for 2 years. My mother spent 15 years in a skilled nursing facility. She wasn’t unusual. Policies were underpriced for two reasons. To be able to sell them and a big error in calculating life expectancy. If people continue to live longer and with more older people the cost of long term care will explode. Presently medicaid covers most of the cost. This is unsustainable. I’m not sure what the solution is but it’s a problem you hear little about. Most people don’t know that the biggest expense for medicaid is paying for long term skilled nursing care. To my utopian imagination, it sounds like a gigantic opportunity for a Job Guarantee program. My dystopian expectation is that we’ll get for-profit robot care. Perhaps the robots will at least be polite. Yes and no on job guarantee. The MMT jobs program calls for the non-gov’t economy to hire all they want and the JG to cover the rest at minimum wage. This absolutely does not work for this sort of care work, in which employers everywhere are already finding it difficult to find workers despite paying (a bit) more than minimum wage, and in which any sort of sane, socially-appropriate care policy would focus on developing long-term relationships between care givers and care receivers. But, yes, there is a virtually unlimited demand for such work, and it will only grow. MMT is silent on the impact of a serious federally-funded care-work employment program, in which care-givers made a decent wage so that they could choose this as a career without a lifelong vow of poverty, and care receivers were able to receive such care at reasonable cost, with the private sector having to adapt to the govt sector rather than the other way round. “Just Die.” It’s pretty simple. Of course, the vultures are helping get “death with dignity” and “assisted suicide” legislation passed, working with “liberals” for whom this is “one of those issues,” like intersectionality and stuff. Looks like “concern” and “individual liberty” and “choice,” but it’s just about monetizing decline and death, and reducing them to rentier opportunities. The way the medical community (sic) makes a profit off the later period mentioned above is to do an unconscionably volume business. Become medical director of several dumping ground facilities, breeze through late at night “seeing patients” by a glimpse at their chart, scribble an order adding a few more meds to their polypharmacy list. Then off to the next dump. Or don’t even show up, just have a med assistant do it and sign for you. And be sure to tick the boxes that your coders and billers need ticked to assure payment. “Health care” in the Empire: another Big Lie. eventual suicide is my long term care plan. don’t want to be dumped into some ward, pumped full of drugs, and turned into a slowly decaying profit center for some corporation. Yes. the 9mm LTC plan will become ever more appealing as time goes by. We can joke about this but I can count 3 elder suicides in my extended family/friend network. All of them male, in declining health, and living alone. There has to be a better way than 9mm. What do civilized societies do? We’re in our late 60s, healthy (no chronic illnesses), living frugally, have no children, a little savings, and maybe a smallish inheritance at some point. So when things get too rough to maintain, we’ve both talked about the self check-out option. I’m partial to the heroin OD, painless and less messy. This country is supposed to be more civilized than the developing world, yet I think the elderly are cared for better by their communities in many developing nations. This would be a graceful route, but could conceivably be screwed-up. Hence the thought of adding carbon monoxide in a tight, locked garage. It might get hot and uncomfortable, but the Nembutal should kick in pretty fast. The topic here, after all, being insurance. Some would say us Aussies aren’t civilised, but heck you Americans know how not to do anything properly – unless there’s a buck in it. When I couldn’t care for him anymore, was too burdensome, we got him in a Nursing Home. Most are run here not for profit and the rich and the poor, like my Uncle, get exactly the same treatment. And its bloody good, food, rooms, staff, visits from his doctor, trips, activities, he can even smoke his beloved fags. Those with assets must lodge a bond, not sure of exact details but it’s around half a mil or so and then must pay a daily rate. So, effectively, those left (spouse or children) must run down their assets for the care. I know my neighbours (twins) took on a mortgage of their Mum’s house to meet the bond requirement. When their Mum passed, they got the bond back. For my Uncle, the home gets $49 a day from me, from his aged pension – leaving about $100 pw (most of which goes on his smokes) – and the balance of the real daily rate, around $250 per day from memory is paid by the government. My thinking for some time is that (assisted) suicide will get easier and easier (more legal)– there’s just too many of us (baby-boomers). Actually, that’s fine with me. As pretzelattack said, who wants to be ‘dumped in a ward and pumped full of drugs.’? I’ve spent enough time visiting nursing homes to see how bad it is for most people– no wonder no one really wants to end up there. And if you don’t have really diligent friends / relatives, it’s worse. the problem is always that “you have to do it before you’re ready” :) — because if you’re failing too much cognitively or physically, it’s too difficult to pull off. So, when will a Soylent Green solution be put into effect? Needs planning and time to get the industrial strength voluntary death to food production operative. And, yes, Soylent Green is people, but there is some control possible for those who realize they need to die. And given that a recent TED Talk expert postulates that by 2027 we will not have the land or viable seafood in increasingly stressed oceans to feed the burgeoning world population, it would be for the common good to be recycled as protein (or whatever we aging humans would be good for) instead of cremated or buried. But don’t let the Corporatists of either party be in charge of something like Soylent Green facilities. They’d probably treat those seeking a timed death the way cattle and other live stock are treated. How long hanging on a hook? Opiates appear to be replacing cigarettes as the longevity reduction tool du jour. Oddly enough, both are marketed by very large, highly profitable corporations with massive political clout. I don’t get this. Assisted suicide significantly cuts the profit from long term care. It’s also a perfectly rational response – faced with a diagnosis of personal decline that will absorb all of your lifetime savings to keep you alive in pain and distress, or euthanasia in the knowledge that your children get an inheritance.. what do you choose? I mean, ideally you’d stay alive, healthy and independent, but that’s not always on the table. Turnover, sir. And the fees for the “assisters” who monetize the model. And the knock-on effects of “clearing out the dead wood” and freeing up expenditures, otherwise made on warehousing “care” of Useless Eaters. for other looting opportunities. Always, in these “movements” and “disruptions,” there are winners and losers: buggy whip makers, vs Henry family blog Ford. What is the value of a human life? Who sets the price? Got to pay to keep playing. And for those who choose the 9mm “final solution,” please kill a few oligarchs on the way out? And finish the task in a way that does not mess up the home or apartment? Maybe do it out in the street, over a storm drain, so the cleanup is easier for those who remain? A relative shot himself in bed, was not found for several days in a hot climate. Hard on the kids (though some atomized offspring may not care) and hard to clean up and sell or move into the place. What a (fb) species we are! none of us are easy to clean up, whether we spend our last years rotting on a dementia ward or take the early retirement option, but i’m sure we will all give it due consideration when our time comes. death has never been easy, but the solution of various nomadic peoples to leave the elders they could no longer care for behind was at least quick, and kinder imo that what is happening today. if you don’t have close family or a very committed advocate your last years in a nursing home are apt to be very bleak. I mean, ideally you’d stay alive, healthy and independent, but that’s not always on the table. I hate to be the neoliberal in the room, but how much of these problems can be attributed to the number of obese and otherwise unhealthy Americans entering this stage of their lives? I figured that we have to pay the price of our gluttony sometime. Is that starting now? Is it even possible to have a healthy healthcare system if you don’t have a healthy populace? Obesity by choice has to do with life, quality and longevity… not how we as a people treat end stages of life. coco, take a little wider look at the situation. It is NEOLIBERALISM, the next and current stage of predatory “capitalism,” that builds the manufactured demands and Bernays-induced “needs” that have brought on that obesity and bad-living thing that the Puritans among us want to puritanically lay off on the manipulated mopes who have been taught to eat and otherwise consume their way through the world’s resources. New! Improved! Sugar added! Salt added! Various congeners and intoxicants mixed in to make it all Irresistible! Convenient! Fast! Cheap! Government-approved! YOU made the decision (with a lot of help from us behind the screen) to swallow those Big Whoppers! Now GO DIE! Don’t be telling me that the mass of people who look like Honey Boo-Boo and John Goodman got that way just because they are “morally weak” and ought now to be happy to die as soon as they are past “lootable” condition. A set of very smart and manipulative and grasping and greedy humans built McDonalds and Burger King and Walmart and control fraud and the War Economy and the vast dependence on the whole automobile thing, working long-haul and consistently at it for going on several hundred years now. Like has been observed here, it’s maybe accurate to think of the corporate form as the first, and worst, form of “artificial intelligence,” all those protoplasmic processors linked and synced to drive toward a unitary objective, “profit,” based on looting of resources and consumption and now rentier takings from the mopery. And now we got further insidious and insinuated and intrusive manipulations, built into the “social media” that supplants community between actual humans, in an apparent “public-private partnership” like appears to course between Facebook and Amazon and such on the one hand, and those master deceivers and manipulators in the spook and “security” apparatus. This current situation in the Empire: the supranational, former “American” and other nations’ corporations (now beyond control and regulation as “multinational and post-national legal entities magically outside any law”) have consciously and possibly unconsciously and apparently intentionally connived at, and seek to spread across the planet, all the diseases and problems that “conservatives” blame the manipulated mopes for turning up with. And offer the usual neoliberal solution: price it, algo it, invoke “the market,” and tell us mopes to Just Die. JTM, I get what you’re saying. To put it briefly, I’m aware of the difficulties surrounding diet. It has as much to do with education as anything else, too, with the stupidity of USDA food pyramid making things worse. My thought was that we are at this point now with incredible obesity, which may have something to do with this. Thanks for this. Let’s look at the whole situation as a natural experiment. Neoliberal hypotheses were operationalized “in the wild.” How’s that working out? Horribly. If we were really rational, and not just economically “rational,” we’d see clearly that the profit motive fails miserably when it comes to delivering actual health care. The problem isn’t the way it’s operationalized. There’s just no right way to do the wrong thing. Also, duration of vital signs does not equal quality of life. They say they’re keeping people alive. That’s not it. They’re keeping people from being declared dead. Think of a LTC facility as a lab. Every room chock full of the latest experiments. You can keep things alive in laboratory conditions, indefinitely in many cases, but you call that living? Also too, running away from death is no way to live, either. Embrace it. Die right now. In fact, you’re arising from a process that involves both coming into and going out of being, all the time. 30+ years of life in the lab for chicken heart tissue, why not for people? What about a different model or type of LTC policy that includes universal life features. For example, Lincoln Financial sells a Moneyguard policy with a lump sum buy-in that is returnable, with caps on the amounts payable, plus riders for inflation and length. Better approach in terms of customer risk? I have an elderly friend whose sister had a long term care policy and that policy had a complicated formula for monthly payouts. It turned out that when the sister eventually moved into a facility, the policy paid out just a fraction of the charges. She was lucky and had the money to pay it herself but her policy was basically worthless. My parents are way past qualifying for a policy (both well into their nineties) but I have been looking into whether they qualify for a veteran’s pension based on my dad’s service. And it seems to me it works pretty much like Medicaid. I believe that everything has to be spent down before they qualify (I might be wrong?). I wonder how all this will work out. Minimum Social Security payments are unlivable even when a person doesn’t need care. So what do people struggling in their sixties do as they age and become infirm? Robots are also less likely to commit emotional and sexual abuse or to forget to check meds. or joke as somebody chokes to death (not talking about the eric garner cops, but a team of nurses in a ltc facility). 1 A rate increase of about 100$ a month (as I recall the monthly premium was going from 3 hundred something to 4 hundred something). This would have kept her benefits the same, but still falling about 100$ a A DAY short of what the supposed average nursing home in Fresno charges. What I got out of it was: How in the hell is anyone suppose to be able to afford the daily shortfall???? AND….this policy was only good for 3 years. After that, you were on your own. You nailed one of the more important issues “How in the hell is anyone suppose to be able to afford the daily shortfall???? 4,500 dollars a month!” What if they had NO COVERAGE? It’s either you transfer part of that risk or you take it on all by yourself. We do have some of the same issues with Nursing Homes as we do in our overall Healthcare system. Some are paying for others. How can you afford to keep doors open when Medicaid pays you 70 cents on the dollar? Any dollars coming from these policies will help the quality in these facilities. And, if gone uninsured, it will break Medicaid completely! I agree that our Industry has acted bad at times and I have fought those agents who sold these cheap, cheap policies. But, we cannot “throw the baby out with the bath water”. 88% of those getting rate increases are keeping their plans in place. You did the right thing by helping someone make adjustments. The risk is still there. It may be shorter but it’s still there! Today, we have corrected the rate increase problem but the consumer is unwilling to pay the price for that coverage. Sadly, they have more health issues than their parents or they are healthy to the point they will outlive their parents. Making the probability of needing care greater for some or the cost factor to escalate more over time for those who may not use coverage until they are in their 90s. Life Insurance with Long-Term Care riders does not answer the problem. The problem is that we have too many who are uninsured (no coverage) and most will have to use multiple resources to pay for care. This is not something you can “set and forget” it has to be a part of anyone’s retirement plan. Long-Term Care Insurance is still the best way to leverage this risk. It just may take riders on a person’s Life Insurance or Annuity to make it all work. If I missed it, sorry; The insurance companies have their billions invested to make more money for stockholders. Money invested in the same junk CalPers and other pensions are losing money on, which has a very reasonable chance of blowing up with the market crash and losing 50 or 90%. They will become insolvent and the plans will be another paper promise, unkept, mutable and destructive. As many have noted, this isn’t a future problem, as it is happening to seniors now. The key is in that article about Amazon, capital gains, and business strategy. When money flows here, almost all of it flows to a handful of people. Most people don’t get enough money to live. They don’t get enough money to live, and a fortiori they don’t get enough money to buy insurance to pay for them living. They might buy something that claims to be insurance, but when push comes to shove the money will not be there. This post got me wondering “how does Canada do it?” Sounds like there is some coverage, but they have something called “Local Health Integration Networks” (non-profits, started in 2007) work out the details. Canada has a lot of support systems for seniors because the single-payer system means they don’t want them to end up in hospitals which are very expensive places to house people. So the health care system will generally cover a lot of costs to help people stay in their homes or assisted living facilities, especially if there are health related issues. So you are expected to pick up a number of living costs, especially if you have assets and income but ultimately there is a lot of support from the system. In a fragmented healthcare system like the US, there are lots of cracks for people to fall through and never be heard from again. My Canadian mother, age 95, lives independently. There are indeed government-provided financial incentives to stay home as long as possible, and maintaining her independence helps give purpose to her life. First, complex products sold by financial services companies place the consumer at a material disadvantage and can often be used to take advantage of them. Second, no matter what they say financials services companies do not compete nor try and serve their customers — they prey on them. This, it was this same thinking that caused the P&C industry to get into CDS in a big way in the late 90s. They tried to apply the same actuarial and underwriting techniques they generally used to credit. While one can say a lot about their erroneous thinking, what matters is that it blew up in their faces, bigly, and was a dry-run for the credit meltdown in 2008-09. One can say the same about the big variable annuity sellers, who sold mis-priced options in their policies (GMDB, IMDB, equity-indexed) that were in affect long dated options that they didn’t reserve for. This ended Conseco, Skandia and severely hurt Equitable (nee AXA). Why I am wrong to think the same seeds of self destruction have been sown and are currently sprouting? I have looked at LTC policies a number of times over the past 20 years since they were first being pushed. I never liked them because it seemed like a big risk for the insurers way in the distance that they would struggle to price. I had no idea if they would even be in business then, which is not an issue for term life insurance or even disability that has an end date of age 65. They also looked like very complex policies with lots of gaming opportunities for the insurers so that it would be difficult to ever collect from them. So having goods jobs, we have focused on the self-funding route where we are assuming that our nest egg, social security, pension, and house are all part of the mix to pay for LTC coverage if and when needed. In the early years that cash flow should cover nice vacations and then be available down the road for LTC if needed. It requires aggressive saving and not retiring early, but I expect we will have better piece of mind. Since we are at the tail end of the baby boom, I have also figured that there will be lots of facilities built with their number of residents declining by the time we would need the space, so I expect hearty competition from providers at that time. Competition from providers? The most likely model is that one or a few will buy out or force out all the others, as is happening across the neoliberal board. A UTI required a trip to the hospital (it presented as a psychotic break and her belief that dad was trying to kill her, so she’d run out into the street screaming for help.). The ER doctor was compassionate, and understood she could no longer live in the home because of the level of care she needed and because she still believed dad was a threat. He “admitted” her and kept her in hospital for the three days required to have Medicare kick in for 100 days. A patient discharge coordinator had a number of care facilities with space. One, in Petaluma, CA, had a bed directly across from the nurses station. She was transported without incident. Immediately felt comfort and safety and seamlessly settled into a routine -and was popular with both staff and fellow residents due to her empathic, kind nature. Dad was able to visit as she forgot her feAR of him. The staff was unbelievable in the level of care she received and I was contacted on both a routine and as needed basis. Was required to get conservatorship and medical qualified without bankrupting dad. My worst fear was dad would die and she would no longer qualify for medical and not be able to direct pay. She qualified for hospice in place ND received both increased care and volunteers would come and play music for her. She died 2.5 years later of end stage dementia and an infection we decided to not treat, and limit to palliative care. I will be forever grateful for every bit of care and services she received. I plan an at home suicide for myself. I hope that I have the option when time comes. I share your plans, laura. My father ended up spending 25x as much for elder care the last 12 years of his life as he’d paid for a home in 1970. Boomers are **not** going to inherit; all the money went to privatized elder care. IMVHO, without moving some of these services into the public sphere, we’re asking for disaster. It’s a lack of imagination, more than a demographic problem. We have the potential to create meaningful work for people (harking back to the video of Jonathon Hari a few days ago at NC), and we need to grab it with both hands, embrace it, and build it to a scale based at the level of cities and school districts. This whole area is ripe for practical, community-based public policy. I’d take the idea of ‘car sharing’ and expand it to senior services; you’d have transparency, real-time information, quality control, resources monitoring, and decent jobs all rolled into one lovely package. 1. Why don’t we have local, municipal-based services that enlist (and train!) high school and college students to drive people to medical and dental appointments and then put an hourly sum into each student’s college fund — guaranteed work driving seniors in exchange for income split 40/60 between ‘money in hand’ and ‘college or technical school fund’? 2. Why don’t we provide health coverage to anyone who spends at least 12 hours/week driving or assisting seniors? As long as we can prove they’ve put in the time — and I’m quite certain that doctors and medical assistants can spot a good caregiver (!) — those people should get health coverage in exchange for this form of ‘community service’. 3. Cities would be smart to work with local schools and set up training for students who are temperamentally, physically, and intellectually suited to work with seniors, and look at this as a ‘jobs creation’ program in every community. (I say ‘physically qualified’, because I know first-hand that hauling wheelchairs, walkers, and seniors requires a certain level of fitness and strength.) Seniors would get care; students get a sense of human frailty, a lesson in taking care of their health, some money for college, and invaluable experience. IF students were able to get ‘community service’ credit, plus get some mentoring, it would be a triple-quadruple win. 4. With ‘car sharing’ technology emerging as a solid solution to ‘cooperative use of resources’, a city could adapt that kind of model to the problem of getting elders safely and kindly to medical appointments, shopping, and ‘outings’ (a haircut and a burger out). These programs work off a magnetized card, like a credit card: when a user needs a car, they put their car card over a region on the windshield to activate use of a specific car (which is identified uniquely within the system, and can be tracked and monitored). Zipcar or ReachNow can monitor where you are, where you get the car, where you drop it off, and monitor maintenance. Why couldn’t seniors have a ‘services card’ to use when they need a ride, and that ‘card’ can track the services provided by Student 1, Student 2, who would carry a ‘card reader’. When a senior catches a ride, or uses a service, they could swipe their card in **that student’s card reader**. The ‘senior-services’ system would then allot payment and send out a ‘quality control’ phone call or visit at intervals. Monitoring whether those services were actually provided would be reasonably do-able. Was 80-year-old Ann actually taken to the doctor on time, then on to the grocery store? Simply monitor the movement of the (student’s registered-in-the-system) vehicle, in the same way that Allstate, Zipcar, and ReachNow already use GPS to monitor and track vehicle use. The quality of services could **easily** be monitored via an app, a follow-up phone survey, or (best of all) by a visit conducted by the mentor-monitor employed by the local city or school district. 5. This kind of program would probably not scale beyond the size of a school district or local city/neighborhood. It would also require (minimal) staff to implement, train, and oversee. In my experience, that kind of work is best done by social workers, AARP related providers, and medical clinics. 6. This kind of community-based model would strengthen communities, provided that the quality of the services was monitored so that seniors were clear about ‘boundaries’ of what they could ask of students, and students were mentored to meet certain quality standards. Would my idea be a little too ‘Big Brother’ for some people? Perhaps. But is it so great that we have a nation of kids flipping burgers at McDonalds, rather than learning life skills and helping out in their communities? Everyone would be better off it the teens had more meaningful work. And also, if people who only wanted supplemental income could follow some kind of work model that enabled them (a la Uber, but without the weird, creepy Silicon Valley overhead) to work 6 hours one week, and 24 the next. If I were an insurance company exec, or a mayor, I’d be on the phone ASAP to Zipcar or ReachNow to start asking about how to leverage their technical expertise and architecture to make communities safer and more humane for seniors, while also keeping Long Term Insurance more affordable. Wow. Some excellent ideas here. Fits in with the emphasis on local solutions to problems that seem to have a difficult path on the federal level. (Not that we should give up on these). I will forward it to my choice in the mayoral elections, soon to be held where I live. Some great ideas, but I see a loophole regarding car insurance companies. If students are getting paid in some fashion for driving these seniors, can the car ins company bail on any claims in case of an accident, stating the driver needed a commercial policy for proper coverage? Sorry to be a downer, but I don’t trust ins companies any more than big banks or big pharma. I remember years ago when I had a business, my insurance agent told me if I even put a magnetic sign on my vehicle advertising it, I would need commercial insurance (much more expensive) for any coverage to take effect. Input welcome from fellow readers more knowledgeable than myself. I would agree that auto insurance liability would be one possible barrier. I can think of a few additional possible barriers as well. Many elderly individuals who need help with transportation need it because they are wheelchair bound, and the driver would be required to assist them to transfer from chair to car, fold and stow the chair in the trunk, and perform the reverse upon arrival at the destination. Chair bound elders who can’t self-propel the chair will also require the driver to push them to their final destination, such as the waiting room of the doctor office, for example, and possibly wait with them in order to push them to the examination room. So the ride could be more than just an Uber-style pick up and drop off service. Electronic wheelchairs pose the additional requirement of a lift and a van. For elderly citizens who are not chair bound, a common barrier is hesitation to give up the privilege of driving because they perceive it as a relinquishment of independence. They are able to continue to drive even past the point of being able to do so safely. In Florida, a person’s license cannot be revoked due to forgetfulness, for example, even by a physician. We therefore have frequent “Silver Alerts” in which everyone is on the lookout for a car with an elderly driver that has gone missing. Their options are limited to bus service, taxi service, and Uber, none of which are optimal, yet we continue to fail to explore how to overcome the barriers to make a suggestion such as yours workable. Here in FL, revoking a driver license (even though it is privilege and not a right) is the proverbial third rail of politics because we have a large voting population of seniors. If we continue to pretend all elderly drivers possess equal driving ability, we then also have an automatic excuse for not allocating funding to provide decent alternative transportation solutions for those who can’t, and our politicians can keep their heads firmly planted in the Florida sand. In CT a man sued and was able to get the medicaid payments to cover cost of his mother’s care in his home with home health aide & visiting nurses as needed. Depending on the state of the patient this is a better job for a nurse aid than working at nursing home, but still awful. Benefits and pay are bad, home health aids (HHA) are often hurt on the job having to physically manipulate people (back injuries), and no pay to cover gas or the time driving from one home to the next. To be a nurse aid one must go take a year program at a community college and get certified by the registry, most who do this are immigrants & the working poor. I’m 74. I cannot afford the long-term insurance let alone the long-term health care and I have no family members waiting in the wings to help..
Actually, it will be me saving up plenty of the monthly Percocets for my arthritis and spinal problems, and then swigging them down with my favorite alcoholic eggnog. It will be my own affordable care act. Oh, bless you, sharonsj. You speak for many of us, I daresay. Excellent, excellent (yet admittedly depressing) article, Yves. Gee, there must be laws against these ‘broken promise’ policies that folks paid into for many years? I’m sure some govt agency will go after them for such practices & help bail out the victims. Yes, our healthcare in the US currently is a disgrace. I have reached out to some friends to suggest a co-op type living arrangement. Some of us younger, some of us older. While not full time trained care help, a community that supports each other can go along way. And when someone passes on, the dwelling space is given over to someone willing to participate in the whole program. No inheritance to family. I have no children. My wife is suffering from some memory issues (not typical dementia but challenging) and we lost everything in 2009 in the crash. We are screwed unless I get creative. We’ve talked about doing something similar, and have mentioned it to a few friends, but haven’t taken any concrete steps. It would need to be structured in such a way as to make it attractive to the younger people. Americans are going to have to remember how to band together to help each other or we’re all going to be screwed, young and old. A friend of mine had this plan 50 years ago. She is now reaching an age and condition where it may come into the foreground. However, it turns out it is not easy to get contemporary people interested in anything so communal, especially the young. As hellish as other people may be, though, it might be preferable to the 9mm and similar solutions. If so, better get to work on it now. Here’s a cut and paste from a craigslist ad in my area (Northwest Arkansas). compensation: Pay range from $8.50 for training to $12.25 for experience. Can’t do much more than pay your own light bill and cook an egg in your ramen noodles at the end of the day on that kind of pay. The post is much nicer to insurance companies than I am. Decades ago when there was a big push by insurance companies to sell the long-term care policies, I didn’t buy because I just can’t see that “Pay lots now, and trust us, we’ll deliver services to you years from now when you’re old and in no shape to fight” is a business plan that’s likely to be fulfilled in good and complete faith. They promised that they would not raise rates on you simply because of your age. It doesn’t take much thought to realize that they can raise rates if they structure the plans so that the aging are isolated into one of the company’s plans while a new plan aimed at the younger targets can repeat the process. Then they can raise the rates on the plan full of aging people who may need the policy to pay out. And sure enough, about the time the original buyers hit 60, having paid premiums for 30 years, suddenly the rates shot through the roof so that those original buyers could no longer afford the policies. As they say, Whocouldanode? That’s me. My John Hancock plan has notified me that they will increase rates about 15% (which seems low), and I’ll turn 60 later this year. I guess I just need to deal with the sunk cost and move on. Astonishing! A very real problem, and people are dumfounded on how to deal with it. Americans are strange: they have a low approval rating of Congress, but send the same people there year after year to make enemies around the world, destroy foreign countries and have their soldiers traumatized in the process, waste stupendous amounts of resources on weapons while poisoning their country with developing the same. I am unapologetically in favor of austerity – the defense budgets must be cut, the money is needed for emerging social problems such as long term care. TINA. Yet, somehow, the same people will be sent to Congress to starve worthy causes of funding and feed destructive ones. A fake democracy it must be – or impotent? Because the right to bear arms, that was intended to defend against a malign government, is being deployed, instead, against deer. To understand why this is, one would have to realized the complex system that has grown up around us here since the 1970s. We are still a democratic republic…,sort of. But there is a dark creature that lurks behind all the dog and pony shows. As I have tried to tell people around me, it is [not] about ‘left’ versus ‘right’, it is about ‘up’ versus ‘down’. What ever your country of residence, beware! Do not let campaign funding and lobbying ‘morph’ into what has come here. We were warned by President Eisenhower and Jack Kennedy. But even then, it was probably too late. Here in the civilised world where health care is a universal right paid for out of the public purse my mother’s dementia and other health problems meant she eventually had to go into long term care. Although the facilities here are usually privately provided the costs are controlled by regulation and in her case were met by transferring to the provider her universal state pension topped up as necessary by the local health board, less a small amount of pocket money used to meet the costs of a monthly visit from a hairdresser, manicurist etc with a little left over for treats. A few extra dollars would have bought her a slightly larger room but that is the only difference between ‘basic’ and supported care at the facility. All her medical needs and care were, of course, met by the public health service. To keep costs down unnecessary ‘services’, treatments and medication were not pushed on her, but I was kept permanently informed and consulted as to her condition. In the course of that it was mutually decided not to inflict on her a treatment that might have kept her alive for a few more weeks and she eventually passed away peacefully. Over this whole period we met and interacted with several other residents who had no family to look out for them, but as far as we could detirmine they were receiving exactly the same level of care with no attempts to exploit them. There are, of course, occasional stories in the press of ‘nursing home horrors’ but these seem invariably down to individual staff members going rogue rather than any exploitation or mismanagement at a high level. Like others here I would still like, and am part of the campaign for, legalised euthanasia (with the facility to do it illegally if necessary – they can prosecute my dead body if they like) but old age here certainly isn’t the inevitable individual catastrophe it appears to be in the US. For those of us who will probably end up on Medicaid, nursing homes are pretty bad. They used to give patients $50 of spending money, but now, take every cent of social security. Patients don’t go on outings, have their own phones or cable TV. They literally can’t afford a candy bar unless a relative gives them money. The food is usually inedible; a dog wouldn’t eat it! There are never books or newspapers. They just sit or are given activities such as coloring xeroxed pictures. Once in a home, they have no way to move to another, or leave. They receive bad medical care and are basically prisoners. I worked in many nursing homes, and it was the same everywhere except for the rich folks. Journalist Jessica Bruder interviews, travels with, and examines the soon to be (and some who already are) elderly Americans (“In mind-set and appearance they are largely middle class”) in her recent book “Nomadland. Surviving America in The Twenty-First Century.” Many elderly, retired, jobless Americans these days who find they cannot live on their social security or other retirement funds (if they have any at all) have ‘hit the road,’ as people did during the Great Depression, in search of temporary work to pay expenses. The consider themselves not so much homeless as “houseless” and thus have fewer expenses. She explores health care options; she travels with one intrepid soul to Mexico for decent dental work. There is some discussion of end of life options. Some of the travelers provide classes and informative blogs for the ever increasing newcomers to these nomads. In a particularly poignant section Bruder describes in detail the horror that is working in Amazon fulfillment centers, because the brutal, relentless, 12-hour+ days offer more money. Amazon finds elderly workers to be more reliable and upbeat than younger workers – they complain less. For those under 55 reading this: If the elderly really do have a 25-50% chance of needing long-term care costing $50,000 or potentially much more, the correct approach to take isn’t “insurance”, it’s “savings account” or “family”. Some form of self-insurance). Insurance, as a financial concept, only makes sense if you have a small probability of needing a large payout, so the fair and honest premium cost is pennies, but the payout is enough to save you, should you need it. Even in this situation, you have to have deep confidence in the insurer, because their interests and yours will not be aligned. Car insurance works this way. Home / fire insurance works this way. Healthcare, except for things like accidents, clearly DOES NOT work this way, so “insurance” is NOT the right approach. No one works for free, so the cost of the “insurance system” gets tacked onto your premiums. Next, the friction of having to negotiate with an insurer, whose interests are almost diametrically opposite yours, is not a recipe for happiness. The insurer will have every incentive to avoid keeping their promises, so unless the deal is as straightforward as, say, term life insurance, odds are you aren’t going to get what you expect. The Genworth example shows that the better the deal seems for the insured, the worse it is for the insurer. If the insurer makes a deal too sweet for their customers, the insurer can go broke. That’s not fatal to the workers and often not even the owners of the insurance company. Just get another job or start up a new financial scam business. But the insured, who had counted on being protected from risk by the insurer, get nothing. So not only does the deal create conflicting incentives, the penalties for failure are deeply asymmetric. Too many of these “insurance” agreements are printed with snake-oil ink! Side benefit – it bypasses the insurance me$$. Whatever your age, do whatever you can to have a close family and bonds at church…if your church is snotty, change. A friend had served her church for 50 years teaching Sunday school, etc. and was refused sacraments and a grave for lack of more money…so she found a kinder community. Americans were brainwashed to be such “individuals” they have few really warm families. Children are actually ashamed to live with parents…not live OFF parents, which is the norm when they leave home!!! Living OFF your folks is not the same as living with them, or other family members. Mexicans never heard of nursing homes until wealthy Americans started retiring down there. They are a disgrace to our culture….or non-culture would be a better term.